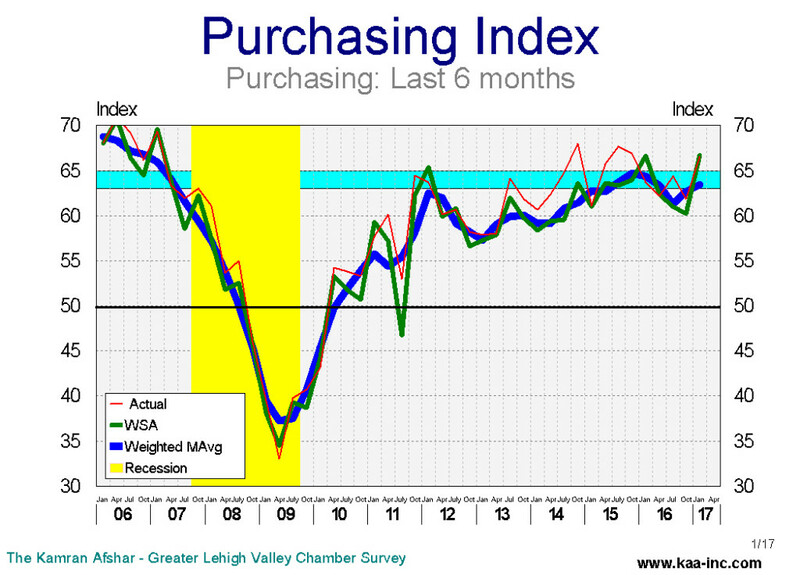 Business sentiment and the overall confidence in the local economy spiked in January over its October 2016 level according to the Kamran Afshar- Greater Lehigh Valley Chamber of Commerce survey. This is a quarterly survey of Lehigh Valley businesses which we have been doing since 1997. The increase in confidence was entirely due to the local businesses significant increase in their hiring and spending during the second half of 2016, while, interestingly enough, they trimmed down their plans for hiring and spending for the first half of 2017. 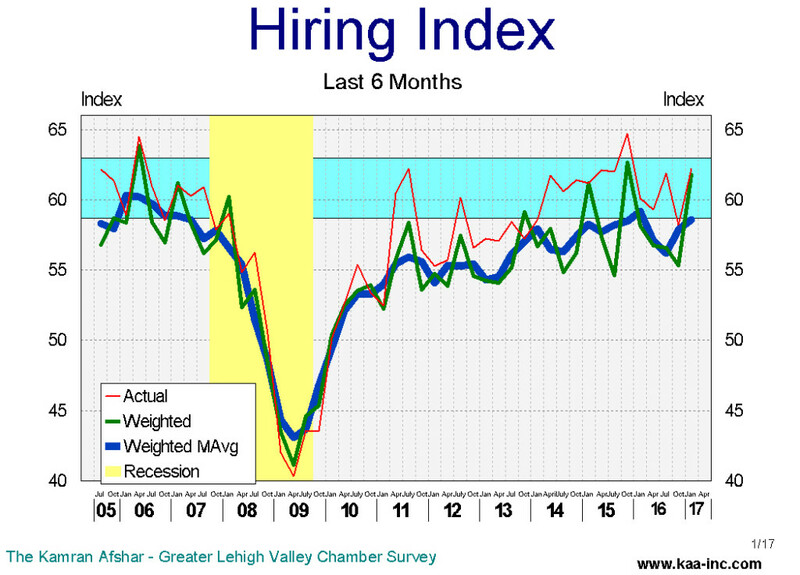 The hiring index for the last 6 months rose significantly in January, jumping by more than 10% above its October 2016 level. And it is back again in the range which is historically associated with faster growth in the Valley. The index visited this range briefly in 2015 also. Local employers are not only facing a smaller size labor pool, but of more significance, they are facing a thinning of skills and expertise within the remaining labor market. From high tech to low tech to no tech, many positions remain vacant for lack of qualified applicants. The purchasing index for last 6 months also recorded a more than 10% jump in January, pushing it to its highest level since 2007, before the recession. It is however, most intriguing that the same businesses which reported such a large increase in their expenditures and hiring over the last 6 months, trimmed down their plans for future expenditures and hiring. The future index, while still indicates expansion, declined slightly in January. More than half of the local businesses with more than 100 employees reported net addition to their payrolls, while only 6% of them had net layoffs, according to the January survey. The larger companies in the Valley also led in the percentage increase in their expenditures. Sixty-five percent of them reported increases in their expenditures, while 18% cut back spending during the second half of 2016. The smaller companies, those which have between 6 and 20 employees have the lead in plans for future hiring, with 44% of them planning to increase their employment levels in the next 6 months. And the smallest companies, those with fewer than 6 employees, which, incidentally, constitute half of all the businesses in the Valley, have the lead in planned future expenditures, with 33% of them planning to increase their spending during the first half of 2017. The survey shows general optimism among local businesses. And one of the most tell-tell signs of the January survey is that the sharp improvement in the local businesses assessment of the past, came alongside with a slight decline in their sentiment about the future. This indicates great enthusiasm with some measure of caution about the future.